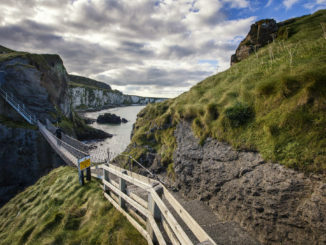 As winter insists on sticking around there’s nothing like a spa break to rejuvenate the spirit and body and I’ve been curious for some time to see what spa resorts are on offer north of the border. 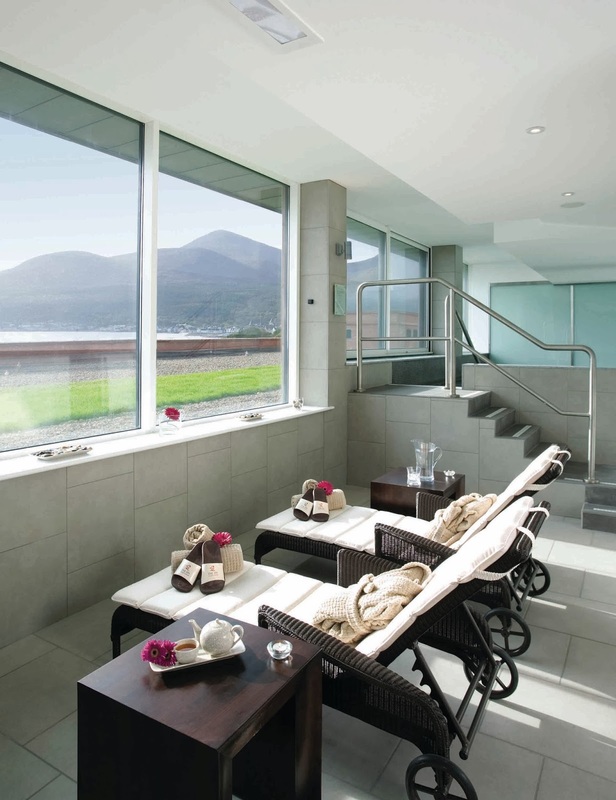 The Hastings Group boasts six hotels in Northern Ireland and the closest to Dublin is the award winning Slieve Donard Hotel with its renowned Spa. 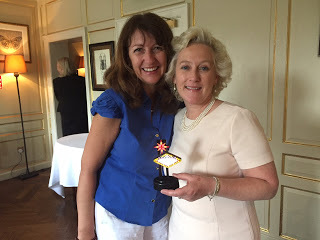 So I asked my gorgeous friend, producer and presenter of Midday, Elaine Crowley, to join me while I checked it out. We did a ‘Thelma and Louise’ on it and drove up the M1 from Dublin like we were getting out of Dodge. I was deceived by Google maps into thinking that we only had a short drive from Newry to Newcastle, but after taking the A25 route we ended up on a rally track peppered with lumps, bumps and tight corners. We later discovered that the B180 route, which is referred to as the scenic drive, has a smoother road. As we entered the town of Newcastle The Slieve Donard Hotel came into view. Nestled at the water’s edge with a spectacular view of the mountains of Mourne sweeping down to the sea, we were transported back in time! And it was no surprise to find that the musician and painter Percy French was invited to perform and stay in the hotel in the early twentieth century. In homage, one of the restaurants is named after him. Another guest to the hotel was the king of silent movies, actor Charlie Chaplin and his visit is honoured by a plaque in the reception area. Built in the Victorian era by the railway as an ‘end of line’ luxury holiday destination, the old hotel maintains much of the character of a bygone age. The new extension which holds the resort rooms and spa is a modern and comfortable build. The swimming pool has a separate sauna and steam room with a lovely view of those mountains. 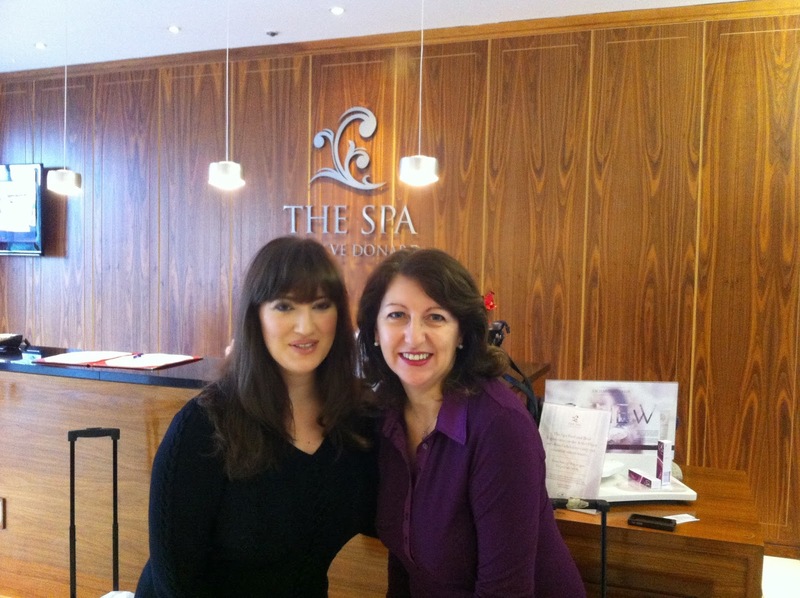 The spa offers the ESPA range along with aromatherapy massages and facials. Elaine opted for an aromatherapy massage and I went for the rehydrating facial. Aisling, my therapist helped to put the memory of the scary roads behind me as she offered a choice of four different lighting options to make the treatment room more relaxing. I also had a choice of oils for my treatment. I opted for the sandalwood balancing oil and Elaine went for the regal Frankincense and Myrrh. We floated out of the treatment rooms into the vitality pool. 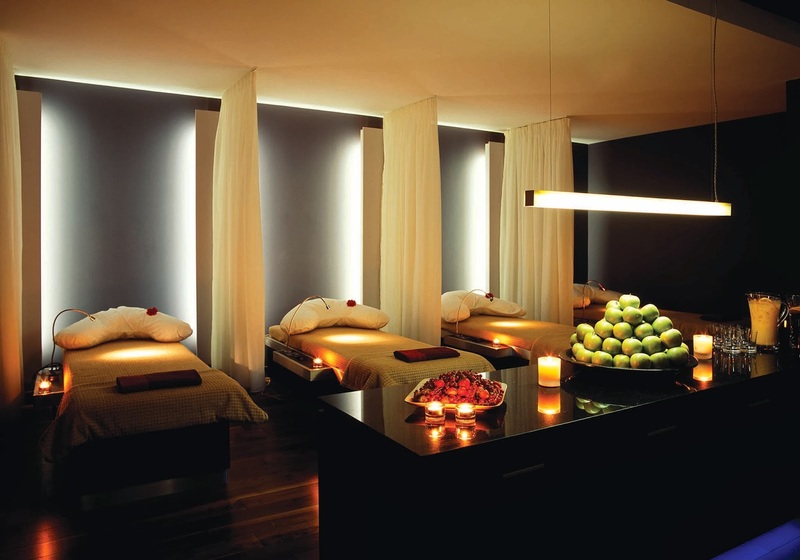 The relaxation rooms have relaxation beds that are operated by remote control to raise the back or feet or both. Personalised earphones and the reading light were a nice touch. Dinner was a delight in the Oak Restaurant, complete with Corinthian pillars and a pianist performing on a grand piano. The menu offered wide choice and the presentation and quality of food was impressive. I opted for the monkfish while Elaine had the rib-eye and we both agreed that it was one of the best meals we had eaten in a long time. The sommelier recommended a delicious bottle of Spanish wine and was ever attentive re-filling our glasses. There was good choice in bars to retire to after dinner. We opted for the drawing room where our sommelier set our wine glasses in front of a blazing fire. When we eventually went up to our room we slept on beds that were appropriately called ‘clouds’ as they were extremely comfy. Next morning breakfast was a hearty buffet in the Oak Restaurant. The Bushmills whiskey beside the porridge proved tempting but fresh cream and honey was a safer option. 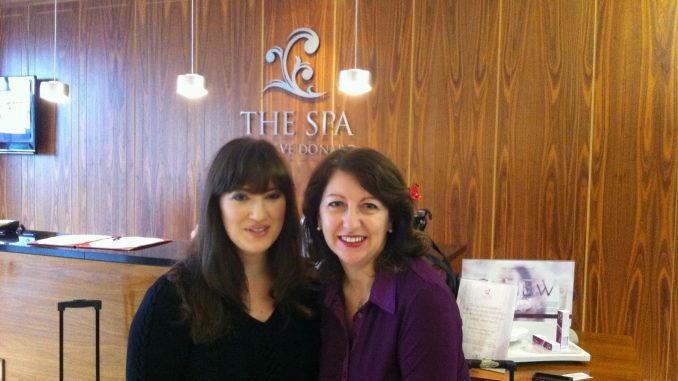 We decided to visit the spa one more time before checking out and watched the waves pound the colourful seafront. 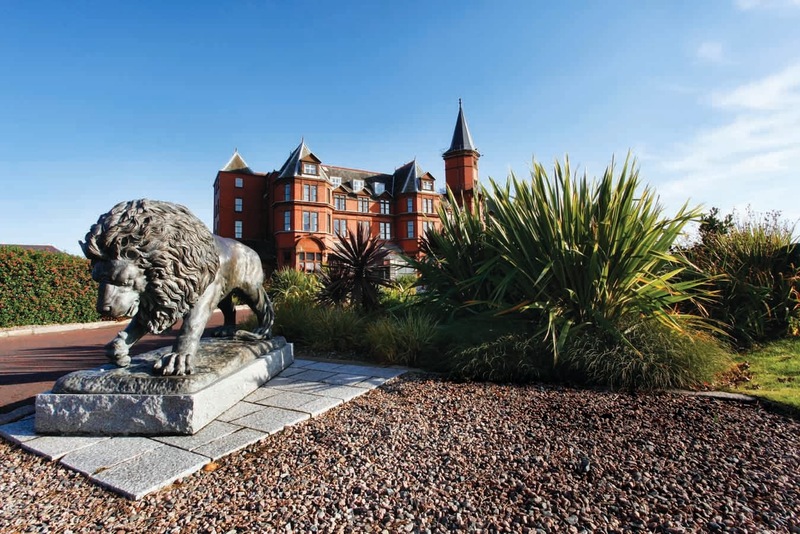 The Slieve Donard was the recent winner of the Hotel and Catering Gold Medal award as the best four-star hotel in Ireland. With a few more delicate touches it would not take much to bring it up to five-star standard as it has all the basic ingredients with a scenic setting, excellent quality food and spa. It is also a popular venue for weddings and parties and as it is a large hotel it can comfortably accommodate all guests, whether they are looking for a fun-filled or relaxing stay. 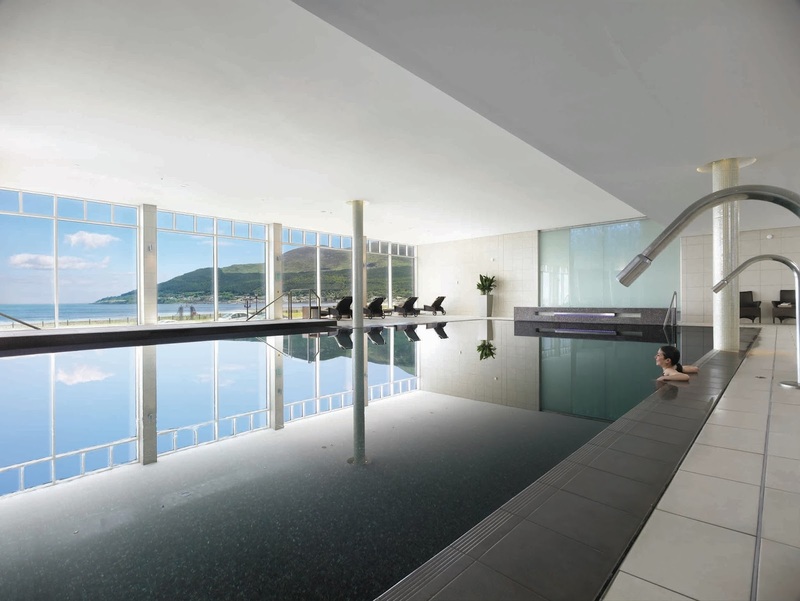 If you want to feel like you have travelled somewhere far away without going through the whole airport experience this may just be the ideal place for a spa break.